Many more images to come...! 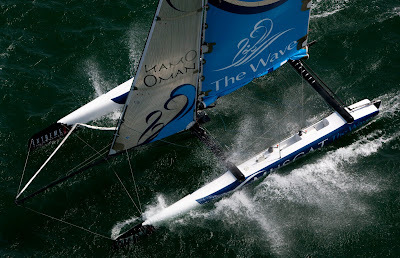 Image copyright Gilles Martin-Raget/BMW ORACLE Racing. Image copyright Guilain Grenier/BMW ORACLE Racing. “Obviously it was quite exciting at the start. We were able to get a piece of them in the entry and that is something we had been thinking about for quite some time, and it started to set up to look like we might be able to get a penalty on them, so I pushed it pretty hard in there. Obviously that left us pretty close to them and we then we had a hard time slowing the boat down. 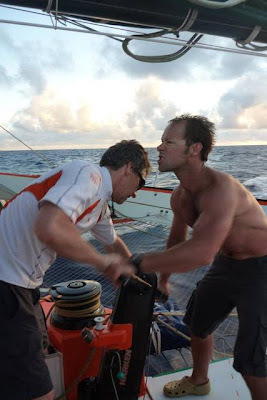 We were in a pretty controlling position then, as time went on through we got ourselves stuck in irons, but also I want to say well done to Alinghi, they did a good job getting out from there. “ I think it is early days. I said before the series that you wont be able to draw conclusions from the first few minutes of these races..." but how about that win...?? “ The piece of kit we are most proud is the wing. “To be honest I think we carried a bit of pressure down, I think we carried it down the lane. It was one of those things, I think, where the boat in the lead was always gaining. Having said that I think that JK (tactician John Kostecki) did a really nice job, he absolutely nailed it on the downwind leg. Full credit to him and the weather team. “It was very very shifty, very very puffy. "For sure at the start after the penalty it felt good they were stopped we could gybe and start. 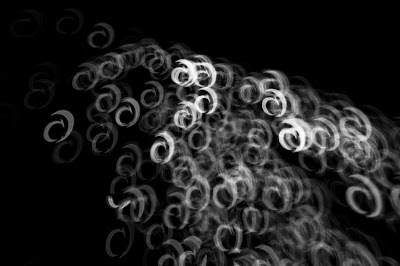 The wind changed quite rapidly. We had six or seven knots during the pre start and right off the start we were surprised with the wind coming in so strong, so quickly, 12 knots, but we thought we were doing good. But they caught up. We had to make a sail change which slowed us, but they were fast today and the wing seems to be quite a weapon. " "They certainly showed how fast they can get their boat going. They could not have come off the line in a worse position and they ended up in a very strong position. 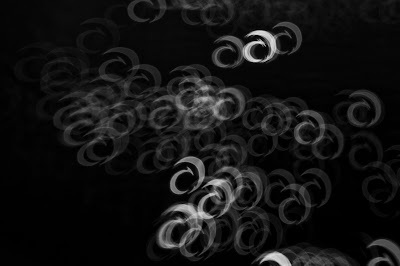 When you are sitting in front of them and they sail up and around you, that is speed." "Actually we had too much sail area for the most part of the race. We did not have the set up we would have liked to have had. There was a bit more wind than we expected, so I don’t think sail area would have made much of a difference. It does, I think, show that the wing is quite versatile in many different conditions, but I am not sure sail area would have made much of a difference." "I have absolutely no regrets and no frustration. Actually I quite enjoyed myself on the water today. It’s racing, you win, you lose that is part of the game. We gave everything we have got over the last two and a half years. So there there is nothing to be frustrated about or ashamed about. Again, the Cup is not over. We still have one race to go. They have to cross the line, finish the race and score two points." “ I tell you, when you are in my position with the ten years that are behind and the team I have and the opportunity to race one more, or maybe two more races in the America’s Cup, you can’t call any day a hard day in the America’s Cup. They are all good days. Today it just happened they were faster, they sailed a good race. The American team, sailing under the flag of San Francisco’s Golden Gate Yacht Club, were quickly able to overturn an early mistake when they were caught flat footed on the wrong side of the start line. 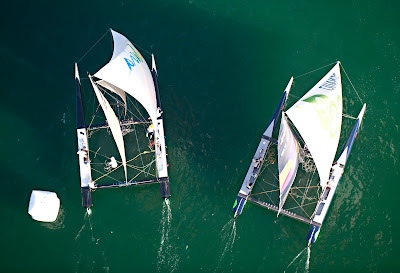 Despite an initial deficit when they crossed the start line of 1 minute and 27 seconds, the trimaran USA, with its massive 68 metres wing sail were able to pass the Defender’s catamaran Alinghi 5 after around 15 minutes of the 20 miles windward leg. BMW ORACLE Racing Team’s final Race 1 winning margin of 15 minutes and 28 seconds is the biggest in the history of the America’s Cup since the 27th edition in 1988, the last Deed of Gift match, when the USA’s catamaran Stars & Stripes won successive matches against New Zealand’s KZ 1 monohull by 18 mins 15 secs and 21 mins 10 secs. It is the first time that double America’s Cup winners Alinghi have lost an America’s Cup match race since they were defeated by Emirates Team New Zealand on Monday 25th June 2007. Then Alinghi went on to win three successive matches to retain the America’s Cup, but now Sunday’s scheduled second race, around the 39 miles Deed of Gift triangle course, of three 13 miles legs, becomes a ‘must win’ for the Defender’s crew. By the windward turn of today’s race USA were 3 minutes and 21 seconds ahead and the black and white hulled trimaran broke the finish line in the growing dusk, to record a winning delta of 15 minutes and 28 seconds. USA, with James Spithill (AUS) steering, managed to immediately inflict a penalty on the Swiss crew when Alinghi 5 entering with no right of way, could not cross ahead of the Challengers just after the entry into the start arena. Starting at 1435hrs (local) in around 6-7 knots of southerly breeze, the heart stopping opening manoeuvres proved some of the best and worst of match-racing the giant multihulls. Conditions throughout were ideal for the historic first head to head match between the cutting edge, giant multihulls. While USA were able to catch Alinghi out for tacking in their water, when both were on the wrong side of the start line, USA could not then capitalise. 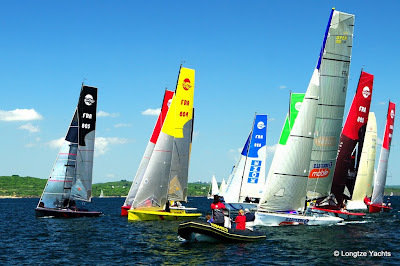 When the Swiss catamaran was able to peel away with speed to cross within ten or 15 seconds of the start gun, USA were stalled out, unable to get moving back towards the start. USA showed superior speed and height through much of the upwind leg, their edge to windward appearing to be greatest when they sailed ‘wing only’ with no jib but just the giant solid wing mainsail, but it was on the long downwind leg that USA were able to extend most over the catamaran. A lead of three minutes and 21 seconds at the only turn of the historic Deed of Gift course was increased to somewhere around 10 minutes and 8 seconds when Alinghi 5 closed the finish. The Defender Alinghi did not initially complete their penalty turn correctly, and it took them an additional five minutes to finally unload their penalty. The second race is scheduled Sunday, warning signal time 1000hrs. Alinghi lost Race 1 of the 33rd America's Cup, a best-of-three series, today after a hard fought pre-start and a 40nm race. The Defender from the Société Nautique de Genève took an early lead onto the course, but didn't hold on to it. "The crew work went well. The difference was the speed of the boats. The solution they have come up with on Oracle is very fast. It's pretty hard to beat them on a day like today," said Brad Butterworth, team skipper and tactician. The race started at 14:35 in a southerly wind between 6 and 8 knots and flat sea, good conditions for the 90ft load waterline multihulls. The top mark was set at a bearing of 180 degrees, due south, 20nm to windward. Alinghi, the port-tack yacht entering the start box, was penalised in the pre-start by the on-water umpires for failing to keep clear. But the Alinghi crew took the lead off the start line after BMW Oracle Racing got into “irons”, a predicament where the boat looses steerage. "We never had a chance to cross them, so it was just one of those things. We tried to get across them but couldn't. When we realised that was the case we came up and tacked over and got a penalty. That was a bit surprising, but it didn't have an impact on the race in the end," said Butterworth. Alinghi 5, with team president Ernesto Bertarelli at the helm, circled around the pin end and onto the race course for an early 1m27s lead, or approximately 660m. The catamaran held pace with the trimaran early, but eventually was overtaken. Alinghi was behind by 3m21s at the windward mark and 15m28s at the finish after performing a penalty turn for the pre-start infraction. Looking forward to Sunday, Butterworth said: "As long as you've got a life you've got a chance. We will regroup and think about race two. Sunday's race will be a different sort of race. We'll see what conditions lend themselves. They looked pretty awesome upwind, and it was hard for us to hold them back. We'll have our work cut out." Tomorrow is an off day as per the Deed of Gift, the America's Cup governing document, so racing will resume on Sunday 14 February weather permitting. USA Skipper James Spithill on coming off the water on 12th February after racing. 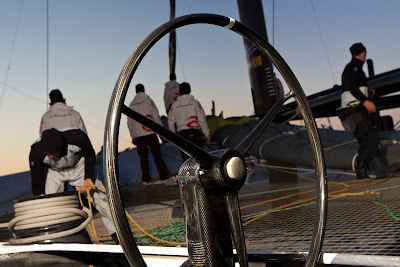 Image copyright Gilles Martin-Raget/BMW ORACLE Racing. On the pre-start: "We did a pretty nice job we were able to get the penalty and really had them on the ropes. But we got locked in to windward and tried to tack out but had a bit of a fumble and got stuck in the breeze. It didn't turn out the way I wanted it to! But leading up to that, the guys did a great job of putting us in a very powerful position." On the boat speed: "I always thought if we were able to fly a hull we'd be faster upwind, but I was genuinely surprised downwind." On the second half of the race: "For the downwind sail combination, the trimmers and weather guys made a good call. 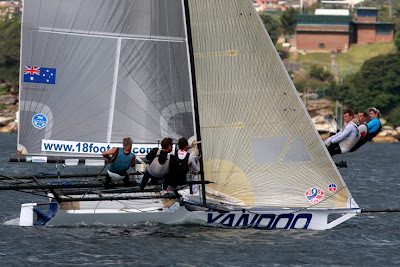 We decided to run with the Code 0 downwind anjd it was definitely the sail JK (tactician John Kostecki) and Matteo (Navigator Matteo Plazzi) did a great job of getting us on the layline." On his feelings on the day: "This was one of the hardest days I've had on the boat with the pressure and direction changes. But all in all it was a good day. I'm sure there are some improvements we can make, but obviously it was great." On needing one more win: "We're taking each race as it comes... There is stuff we can do to improve. Obviously downspeed we need some practics! We're excited to get this one in. It's full credit to the guys. For the shore guys and the guys who got it ready for us, today was a day where everything was great on the boat and that was really key for us as well." BMW ORACLE Racing has started the 33rd America's Cup Match with a convincing victory over the defender, Alinghi. Racing was postponed for four and a half hours before Principal Race Officer Harold Bennett gave the start signal in a gentle 4 to 5 knot southerly wind. After both boats entered the start box, skipper James Spithill (AUS) was able to speed deep into the box on starboard tack, preventing Alinghi 5 - the give way boat - from crossing ahead. As the boats dialled-up into the wind, the Umpires judged Alinghi hadn't done enough to keep clear and penalised the Swiss team. Alinghi, however, made a good recovery. With both teams to windward of the start line, the Swiss made a quick return to start ahead. In fact, by the time USA crossed the starting line, it was over 600 metres behind A5. But then USA started to simply outpace A5 by sailing higher (closer to the wind) and slightly faster. The 600 metre deficit was soon erased, and USA went on to lead by 3:21 around the top mark. Downwind, the advantage to the American boat was even more pronounced. USA continued to add to its lead all the way to the finish line. The final delat at the finish, after Alinghi completed its penalty turn and finished correctly, was 15:28. Groupama 3 in the Forties. Image copyright Team Groupama. "It wasn't an easy night: a lot of wind shifts, light breeze and calms... All of which was coloured by an atmosphere of intense fog and very wet conditions! However, things are clearing ahead of us: there's a slight SW'ly swell with a NW'ly wind and we're making headway under full mainsail and solent jib at nearly twenty-five knots. Everything is grey, as you might expect from the Southern Ocean. Conditions are pretty gentle right now though... For once, the Indian Ocean appears to be manageable so it shouldn't be too laborious a crossing" explained Lionel Lemonchois at the 1130 UTC radio link-up with Groupama's Race HQ in Paris. 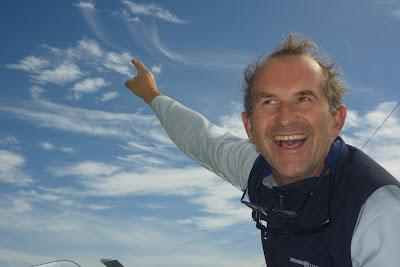 Jacques Caraës on board Groupama 3 points to the wispy cirrus, a sign of wind, in the sky. Image copyright Team Groupama. As such conditions are very good for the coming days since the sea state is favourable with little residual swell. Franck Cammas and his men are now aiming to stay ahead of a cold front, which will pursue them, generating over twenty knots of N to NW'ly wind. By conserving a fairly N'ly trajectory (remaining between 39° South and 45° South as far as the Kerguelen Islands), Groupama 3 could well benefit from these consistent conditions to make an extremely fast crossing of the Indian Ocean! "We're expecting to stay with a NW'ly for a long while, which will mean that it shouldn't get too cold. On the other hand, the route will be a little longer as we won't drop down very far South in terms of latitude. It should be a fairly comfortable and quite a quick ride, a fair distance away from the ice! We'll be able to round offshore of the Cape of Good Hope with a N'ly wind, since another more violent front will drop down from Africa. At that point we'll finally be able to lengthen our stride... This comes as great news after a week of light conditions. Added to that it will be good to sail in the Southern Ocean again as it is always fascinating and a little agonizing. Out there we are all alone in the world, without boats and with only little land..."
The experience of the crew of Groupama 3 is an asset on this long journey towards Cape Horn as, with the exception of Bruno Jeanjean, everyone has already experienced the very special conditions associated with the Deep South, where the weather phenomena are often a lot more violent than in the North Atlantic... In any case, with this fairly organised sea forecast for several days, it'll be a pure glide in prospect for this rather mild introduction. 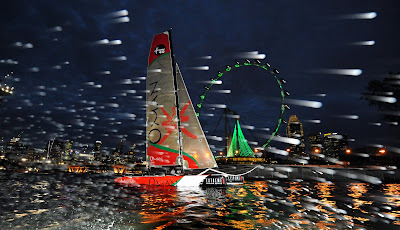 Oman Sail's Masirah night-sailing in Singapore during the Extreme Sailing Series Asia. 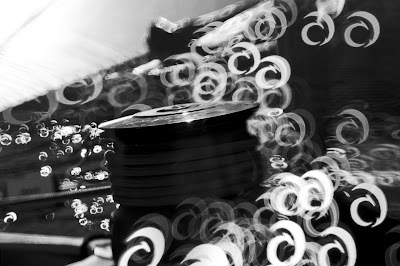 Image copyright Th. Martinez/Sea&Co/OC Events. OC Events took the award-winning circuit to the region to demonstrate what a future full-scale circuit with shoreside entertainment, VIP hospitality and, of course, the on-water sailing, could deliver to the region. For this first Asian series, the objective was to engage with the media and commercial sectors, whilst at the third and final event in Muscat, a two-day 'Extreme Beach Event' took it up a level engaging the public as well. Red Bull racing off Muscat. Image copyright Mark Lloyd/Lloyd Images/OC Events. 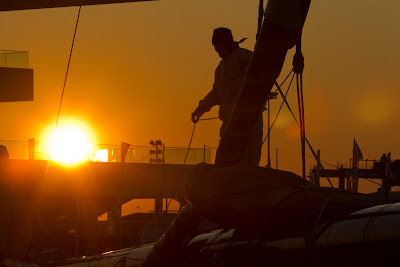 "This first Extreme Sailing Series Asia exceeded all our expectations. The spectacular sailing conditions in all three locations brought us tight racing by some of the very best sailors and demonstrated the potential to venue partners, key opinion formers, government officials and the media what a full-scale series could bring to their region in future years," commented Mark Turner, CEO OC Group, owners of the organising company OC Events. "We developed the European circuit in exactly the same way, starting small with a focus on the VIP and media side and four years later here we are with a multi-stop European tour that saw over 200,000 people watch the action in person in 2009. We made the call to go for this first opening series in pretty tough economic times, but we believe our investment will be successful and are already in discussion with potential new venue and series partners for the 2010/2011 tour," he concluded. 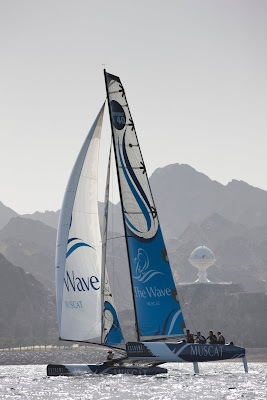 The Wave, Muscat, racing off Muscat. Image copyright Mark Lloyd/Lloyd Images/OC Events. 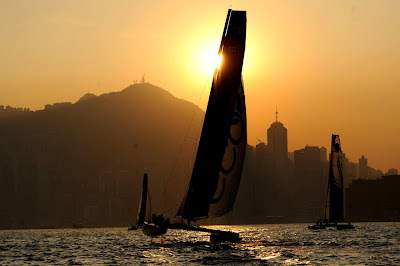 The Extreme Sailing Series Asia circuit received widespread media attention, not only in the countries it visited, but internationally as the media were entertained by the personalities as well as the action on the water. World Sport (formerly Gillette World of Sport), the internationally distributed sports programming, will include Muscat in this week's show which will go out on UK Terrestrial broadcaster Channel 4 this Saturday (7:30am) and the following Tuesday (01:30am) and across Europe. There has been regular coverage from the series on TV channels including a daily live feed on Oman TV, ITV Meridian and Sky Sports (UK), Eurosport and Euronews (FRA), ATV, ORF 1 & 2 (AUT), Media Corp (SNG) and Mediaset (ITA). The reach will increase from March 2010 when a 26-minute programme will be distributed and air on channels including Sky Sports (UK), Sport + (FRA), ESPN (Pan-Asia) and Fox Sport (pan-USA & South America). The circuit began in Hong Kong (20-24 November), racing out of the prestigious Royal Hong Kong Yacht Club for five days including a day with the 200-plus fleet for the annual Around the Island Race, where the Extreme 40s took line honours. The six catamarans were then packed up and transported to Marina Reservoir, right underneath the World's tallest observation tower in Singapore (11-15 December), the first time the stretch of water had been used for a professional sport event. 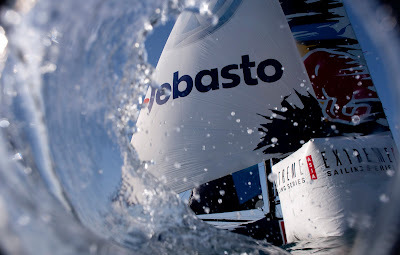 Rumbo Almeria and BT on day 1 of Racing at the Extreme Sailing Series Asia: Muscat. Image copyright Mark Lloyd/Lloyd Images/OC Events. The series concluded last week in Muscat, Sultanate of Oman, where the home team Masirah lifted the inaugural championship trophy. Three days of racing in front of a VIP setup, was followed by an 'Extreme Beach Party' with over 2,000 people gathering at Al Hail beach for a five-a-side football competition, volleyball matches, the Muscat round of the Red Bull Street Style competition as well as watching the racing, which took place in front of government statesmen and royalty for the Omani weekend. "It's been exciting introducing new people to the circuit," commented Emily Caroe, PR Director of OC Events Extreme Sailing Series. "There's nothing better than welcoming a non-sailor to the circuit, be it World record-breaker Assafa Powell in Singapore or a female journalist in her traditional dress who has never even stepped on a boat before. Persuading them to conquer their fears and step onto an Extreme 40 was not easy, but by the time your back is turned, they are on the helm, or trimming and shouting for the hull to fly even higher. It's such a great experience and provides them with a unique story." The Wave, Muscat. Image copyright Mark Lloyd/Lloyd Images/OC Events. Seventy journalists attended the three, five-day events, and when conditions allowed stepping onboard and racing in the fifth man positions onboard the six Extreme 40s. Andreas Tzortzis, from international magazine, Red Bulletin, raced with double Olympic Gold Medallist Shirley Robertson onboard Rumbo Almeria. "That was absolutely fantastic. You are absolutely in the thick of it and that is an experience you don't normally have in sailboat racing unless you are racing yourself. As a spectator, or even as a journalist you don't nearly get so close so it gives you an understanding of the amount of pressure they are under. It is absolutely astonishing." There have been over 180 pieces of quality coverage from the three events, with press junkets at each venue to experience Extreme racing first hand. Journalists attended from Sina.com, China's leading online portal which ran daily reports, China Boating, The Business Times and Today Newspaper all visited the opening event in Hong Kong. An international visit of GCC media attended the final event in Muscat including journalists from Men's Passion, Ahlan and Al Rai in Kuwait, the Qatar Tribune, Ohlala Magazine, Bahrain Confidential and Areej Magazines in Bahrain, Business Traveller and City Times in the United Arab Emirates. 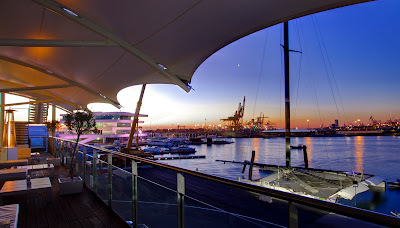 "Our goal was to bring a select group of journalists who could experience first hand an Extreme Sailing Series event. Thanks to the support of the Muscat Municipality, they had the chance to see a public facing event with all the activities on Al Hail beach as well as the racing," commented Caroe. Extreme 40s at the end of the day's racing in Hong Kong. Image copyright Marco Hong/OC Events. Thierry Barot, skipper of China Team was impressed with his first venture into Extreme 40 sailing: "It was very impressive, right in front of the public but still this sport is very intense, delivery is very high in terms of tactics and strategies. I really believe it is the future of sailing. This is what sailing needs in term of development - the Extreme Sailing Series is a sport in itself." Pascal Bidégorry, skipper of the maxi multihull reflects on the change to code organge: "For several days things have seemed to evolve in a good way in the forecast. We decided to change to code orange today, more on account of the fact that we are reaching the maturity date of our stand by, and we have finally the opportunity to have correct perspectives of what wil happen in the North or South Atlantic. We should leave during the day on Sunday, with certainly strong weather conditions from Cape Finisterre. We know that that will be athletic, but we rejoice at last to be able to cast off and attempt the Jules Verne Trophy record." If previously the conditions in the South Atlantic had never been favorable to a departure, it would seem that the position is evolving, and even if within 48H of a possible departure it is still too early to be adamant, it seems as though the end of the waiting time is imminent. Racing finally got under way off Valencia Friday afternoon - leading to a race one victory for USA. Further postponements on the water followed the initial two-hour delay signalled onshore, but this was just for the breeze to settle. It's extremely tricky to set a fair 20nm beat course, and Harold Bennett and his team did a super job in the light winds (less than 10 knots), which varied in direction, but settled as roughly southerly, before the start. The start commenced (and finished) with a classic match-race dial-up between the two boats. USA entered on starboard, coming in on a 2-sail reach at speed around the bow of the committee boat, flying two hulls. Alinghi 5 had a slower entry from the offset at the port end of the line. Spithill initially headed down below the line and then up a bit, pointing directly at Alinghi 5 and holding his course. Alinghi 5 didn't take avoiding action soon enough, so USA had to do so to avoid a collision, turning into the dial-up. When USA flagged, the umpires penalised Alinghi 5. Subsequent to this, USA remained head to wind above the line, and took her headsail down. Meanwhile Alinghi 5 circled around to port and came up beneath the pin to start on time, with USA still stalled above the line. As Alinghi 5 passed beneath USA and carried on out to the right, USA turned back to the starting line and crossed the starting line about 1 minute 45 seconds late, giving Alinghi 5 a head start of about 660 metres. Distances are, however, of a very different order when vessels are as nippy as these two! About 12-15 minutes later, USA, sailing higher and a bit faster (both boats are in the high teens in knots, speed-wise), had made up all the initial deficit on Alinghi 5. USA then overtook Alinghi 5, took her headsail down, pointed yet higher with just the wing, and continued to out-pace Alinghi 5 too, while taking care to stay between a beaten boat and the mark. By the windward mark the deficit was some 3 and a third minutes. Downwind - and as these boats sail in apparent wind, the actual angle isn't that different from upwind - USA sailed faster and deeper than Alinghi 5, reaching speeds of up to 25 knots. As the speed went up, the apparent wind took the headed forward, making it easier to put the bow down. On this leg USA extended to lead by over 2km. Alinghi 5 shed water ballast downwind, but could not make inroads on USA. After USA crossed the finishing line, Alinghi 5 sailed to the line and then went into a long sequence to take the outstanding penalty, ending with not finishing correctly and having to sail back to the line to re-cross it, so extending the winning delta of USA by more than 5 minutes to 15 minutes and 28 seconds. P.S. BMW ORACLE Racing's crew was the same as listed for Monday, 8th February. Others accompanied the crew to the boat on her mooring, including one person who had distinct resemblance to the Michelin Man, given the number of layers he was wearing to offset the cold: the CEO, Russell Coutts. Courtesy of BMW ORACLE Racing, clicking on either the link at the top of the right-hand column on the SailRaceWin site, or here, will put you through to a live video player for the 33rd America's Cup racing. Live coverage, including both BMW ORACLE Racing team preparations and the official America's Cup race footage, will commence at 8pm New Zealand time on Wednesday, 10th February 2010: the first race day of the 33rd America's Cup in Valencia, Spain. N.B. 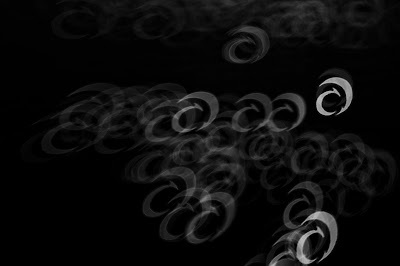 The start of racing on Friday, 12th February, 2010, has been postponed until 12.06 CET (i.e. by two hours), due to weather conditions off Valencia, especially the sea state. Assuming that the boats were to cover each leg at a direct-line speed of 20 knots per hour, the first race would take 4 hours. Due to its being winter in the northern hemisphere, the disappearance of daylight for racing occurs by about 5pm CET. Therefore, racing cannot commence much after 1am New Zealand time in order for the boats to complete the race in daylight. The wind is reported to be at about 350 degrees, around 10 knots, rising to around 12 knots at times. "Hopefully we can get a race off today," said team BMW ORACLE Racing CEO Russell Coutts. "It's quite a complicated weather forecast but hopefully there will be a window in there where we get some breeze. We'd love to get a race going." 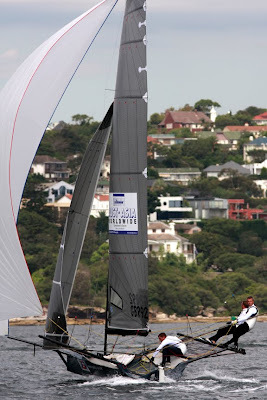 Brad Butterworth, Alinghi team skipper and tactician said: “Hopefully there will be good conditions out there. I think it’s lightening off. The big breeze is going away. I think if we go to a good spot we’ll get good conditions and we’ll be able to have a good race that’ll suit both boats. ‘Environmental Concern in Sport’ Award back in 2008 and was the first 2012 venue to be formally completed, demonstrating the importance this forward thinking venue has had on not only the South West but the whole of the UK. The 16 strong judging panel selected the WPNSA for the shortlist through offering a flexible and meticulous approach to event services, the commitment it has as a venue to serving the needs of its visitors, a distinct improvement in all aspects of the venue from the previous 12 months of activity, demonstrable financial growth and proof of creative innovation in the approach to hosting and marketing sporting events. Judges include; BBC Broadcast Journalist John Inverdale - Former Chief Press Secretary to the Prime Minster Alastair Campbell - Paralympic Athlete Dame Tanni Grey-Thompson and Chief Executive Officer of LOCOG Paul Deighton. The final results will not be announced until May 13th at a star studded ceremony. The Academy was selected through submission of case studies detailing how the venue hosts a successful calendar of international mass participant water sports events as well as instigating activities accessible to the local Weymouth and Portland communities. Being nominated for this award highlights the calibre of the venue and the facilities it has to offer for yacht racing to dinghy sailing, triathlons to corporate functions and weddings. ‘Everyone at the Weymouth and Portland National Sailing Academy is delighted to have been shortlisted for this prestigious Sport Industry, Sport Venue of the Year 2010 Award. We work tirelessly to improve the quality of services and events and it is incredibly rewarding to be recognised for this commitment’. Rob Greenhalgh steered Benny to victory in the Invitation Race. Image copyright Frank Quealey. Former Giltinan champion Rob Greenhalgh and his crew Dan Johnson and Phil Harmer were the masters of terrible conditions on Sydney Harbour when they brought their skiff, Benny, home a clear winner of the Giltinan Championship Invitation Race today. Extreme heat and totally unpredictable wind (at times none) made the racing very difficult for competitors. Andy Budgen's Project Racing finished second. Image copyright Frank Quealey. It was a double for the UK teams when Andy Budgen, James Barker and Matt Mc Govern finished in second place with their skiff Project Racing. First of the local boats to complete the course was the third placed Yandoo skippered by John Inning, with crewmen Andrew Hay and Dave Gibson. Yandoo was third in the invitation race. Image copyright Frank Quealey. The start was delayed due to threatening weather and finally the starter sent the fleet over the windward return course of three laps. At the windward mark the first time there was a mass of boats going in all directions. Asko Appliances (Archie Massey) then became the leader on the second lap before the breeze switched totally and spinnakers were set for the second ‘windward’ leg. The prospect of strong winds coming from the south as heavy clouds circled the course sent many boats heading home to avoid possible gear damage before tomorrow’s Race 1 of the championship. Race 2... Collision between Nedax and Monkey Business. Man overboard. Jammed rudder. Two boats towed. Race 3... Gucci and Floating Free collided at mark 8. The celebrations began last night with 2010 OK Dinghy World Champion Karl Purdie being carried off the water by his fellow sailors. Champagne, hugs and interviews followed with rum and a friendly ‘dunk’ in the drink off the jetty back at the yacht club. The evening was rounded off by curry for 120+ in Little India and then a ‘club crawl’. Once again, the last man standing got home in time for breakfast. Today... ‘dusty’ sailors, dismantling the boat park and OKDIA AGM. This evening – farewell bbq and prizegiving at ICON, Te Papa. Today marks the third attempt to commence the 33rd America's Cup, a Deed of Gift match between Alinghi 5 as the Defender from the Société Nautique de Genève and USA representing the Golden Gate Yacht Club. The first attempt on Monday was abandoned due to unstable wind conditions associated with a passing cold front, and Wednesday's second attempt was postponed shore side due to waves measuring up to 2m. As per the Deed of Gift, the 19th century document governing the America's Cup, today's race shall be 20nm to windward and return. “Hopefully there will be good conditions out there. I think it's lightening off. The big breeze is going away. I think if we go to a good spot we'll get good conditions and we'll be able to have a good race that'll suit both boats. Alinghi, the defender of the America's Cup, will enter the start box on port tack, signified with a blue flag on the stern. 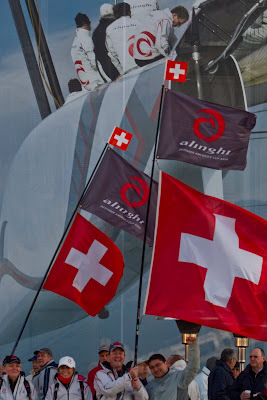 As a team Alinghi counts more than 130 members representing 20 nationalities in seven different departments (sailing, design, shore, weather, media, marketing, administration). The race area covers 450 square miles, or 1165 square kilometres. 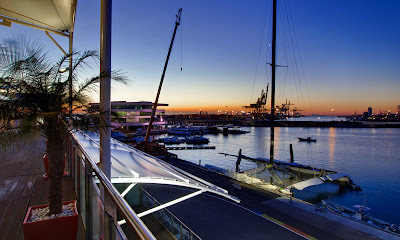 It took 100,000 man hours to construct Alinghi 5. The 1100sqm Code 0 gennaker is one of the three largest in the world. The mast is 17 storeys tall and there are 534m of carbon-fibre standing rigging (shrouds, forestays and backstays). 1970 – Challenger Gretel II is launched in Sydney, Australia, to be the representative of the Royal Sydney Yacht Squadron, the third and last challenge of Australian media magnate Sir Frank Packer. Gretel II introduced several innovations including dual wheels to give the helmsman a better view and to have his weight better positioned to windward, as well as collapsible spreaders to enable the genoa to be sheeted closer to the mast, enhancing her ability to sail to windward. Gretel II was the first challenger to be selected in a Challenger Selection Series defeating Baron Bich's France to proceed to the match. Gretel II, named after Packer's wife (as well as his first challenger Gretel in 1962) was defeated by Intrepid 4-0. It was Intrepid's second America's Cup win, becoming only the second yacht to do so in the history of the Cup. Gretel II was restored in 2009 in New Zealand and is now racing once again on Sydney Harbour. 2009 – Alinghi defeats BMW Oracle Racing in the Challenger Final of the Louis Vuitton Pacific Series, 2-0, the last time Alinghi and BMW Oracle met in a match race before the 33rd America's Cup. Just more of the same around here. Lots of energy being put in by the teams and the media to fill time and editorial space. Interviews with security guards and bottle washers now. We did do one feature on the fact that the BMWOR trimaran has the "sail" 24/7 since they keep the wing up all the time now. There is a small army of people on a watch system, taking turns babysitting the boat on her mooring. We also did a nice interview with James Spithill. We asked Alinghi if we could interview their trainer to get an idea of what type of physical training the guys do during the regatta but we got turned down. The start for Friday has already been postponed until noon. There are big waves on the course from the 30 knots that have been blowing through the area over the past 24 hours. Tomorrow, Friday, is the last day of coverage from Valencia for us, the Eurosport on site team. Hard to believe we have been here for 8 days and have seen nothing. The world feed will still be carried on Eurosport whenever it happens. 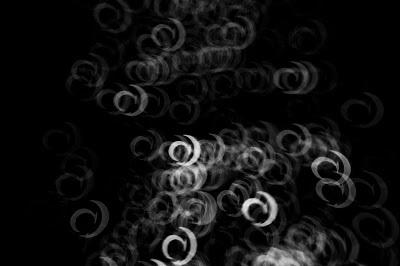 One more update from me tomorrow. Strong winds kept both America's Cup boats in port on Thursday. It was much colder in Valencia this morning and much windier as well. 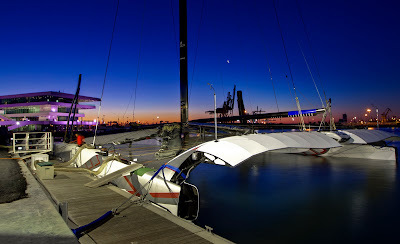 BMW ORACLE Racing's trimaran, USA, remained on its mooring throughout the day. "The boat is moored at the buoy with the wing sail vertical and we've seen more than 30 knots," said Max Sirena (ITA) who is in charge of the wing sail logistics. "It looks scary, but all is good so far." The team remains eager to race. The main reason for leaving the wing sail up is so that the boat is ready to go racing early Friday morning. "Over the last couple of weeks we've built up heaps of confidence," mast man and boat director Matthew Mason (NZL) told the media in a Q+A session. "We're very satisfied. Logistically this thing (the wing sail) is hard. At one stage we thought we'd be lowering it down all the time, but as of today, we've got it up in nearly 35 knots." The forecast is for the strong winds to persist into Thursday night. Friday morning brings a significant easing trend. Cold temperatures are expected for several days. Friday, the Race Committee will make a third attempt at starting race one of the 33rd America's Cup Match. Monday's try was thwarted by a lck of wind. On Wednesday, the Race Committee elected to abandon racing due to the sea state. Friday's race is scheduled to start at 10:06 CET (22:06 New Zealand time). Note from SailRaceWin: A postponement of two hours beyond this time has, however, already been signalled by the race committee. Even around the Marina Juan Carlos 1 the flags were stiffened by the wind through most of the day. The cool February breezes reached more than 30 knots at times. Hopes are high that Race 1 will start tomorrow, but for all of the waiting that has already been part of what promises to be an historic 33rd America’s Cup match, neither the premium placed on patience nor the bracing temperatures have cooled the sense of anticipation, nor made any clearer what might happen when the two giant multihulls finally meet up. Debate ebbs and flows about every aspect of the Race 1, from the simple binary answer – who will win, right through to the detail of changes to the match racing rules to accommodate these giant speedsters. 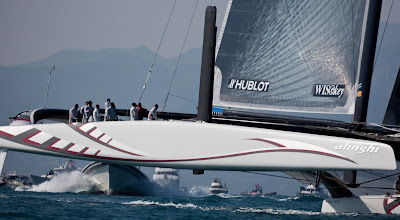 The hiatus has allowed crew members from both the defender Alinghi (SUI) and the challenger BMW ORACLE Racing Team to drip feed technological information as well as their perception of how Race 1 might develop. In an instructive media seminar Ed Baird (USA), helmsman when Alinghi won the America’s Cup in 2007 for the second time, said today that a close race in these multihulls might be one with somewhere between three or four minutes at the first mark, and such a margin could be easily won or lost on the downwind leg. Factor in the fact that so much ground is lost in manoeuvres, that conventional covering (blanketing your opponent with the wind shadow from your sails) is not really possible, all-in-all a ‘whole new mentality’ he warned. Baird in effect said that, downwind is the new upwind. Downwind these giant multihulls are sailing so quick that the apparent wind they generate is only 5-6 degrees different to that when they are racing upwind. Dirk De Ridder (NED) who is in charge of the trim of BMW ORACLE Racing Team’s huge 223 ft (68m) wing which took 150,00 man hours to build, explained some of the differences between his job with the solid foil and the equivalent soft sail. He controls the wing with a conventional traveller system which is lead to a winch, and a hydraulic systems powered by a small engine which controls the shape of the wing. The two element wing is comparatively straightforward, he explained, with nine hinges between the main wing element and the aft flap. The construction of the wing itself is especially high tech, but De Ridder revealed that his controlling key pad system is nothing more or less than an ‘idiot proof’ off-the-shelf garage door remote operating system. Sir Richard Branson, the British entrepreneur who last year made an attempt at the Transatlantic Record was a visitor to the America’s Cup site, touring the Alinghi base, meeting up with Mike Sanderson CEO of Britain’s TeamOrigin America’s Cup syndicate. “We have met with the umpires. They are amazingly impressed with the equipment and they recognise the limitations on being able to manoeuvre the boats in close quarters situations. They don’t want to see close situations, like we saw before, where the boats were two metres apart. They don’t want to see that. “Honestly we expect that the boats will not be together very much. The important part is the start, that the umpires can see what is going on but on the open course it would be a real surprise to see engagement. It is a different mentality of sailing because the boats slow down so much when they tack. Your covering option is not effective like it is in monohulls. “I have four functions on hydraulics to operate the wing and the traveller which is on a winch. We started off high tech with a high tech with a remote wireless fittings, but there is so much carbon between me and the receiver that it did not quite work. So we ended up Mark Sheffield (GBR) went in and bought a stock standard garage door opener which is now hard wired to the computer and is now pretty idiot proof. It has eight buttons, four on and four off and so far so good. It was an example of something where we could spend an enormous amount of time and money, say, flicking on a fancy screen but this is idiot proof and it works really well. “I think if you ask every designer of ours that has worked on the wing they will tell you the same thing, in theory. The wing we have built is basically a very simple two element wing, although the way they have built it and the materials are very high tech. The actual concept is relatively simple. “It has a front element which also holds the structural mast and we have the flap element and by offsetting those two you get an angle of attack on the front element and camber over the whole wing which gives you the driving force and lift coefficient that you need to go forwards. “Ernesto for lunch and Larry for dinner…it is great to see them both. “I love sailing, sailing small boats. We did try to break the transantlantic sailing record last year with my children and on that occasion we hit big bad winds and the mainsail broke and we had to limp home. “I have just had lunch with Mike Sanderson who is team captain for the British team and he is a great friend. And fortunately they seem to have funding for a British attempt. And so hopefully after this we will see eight nine ten teams particiapating and we will get the America’s Cup team back to how it should be with lots of different nations participating. 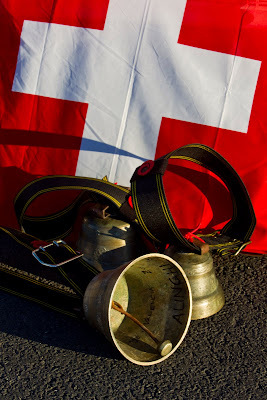 The Warning Signal for Race 1 on Friday 12th February 2010 will not be made before 11:54 hrs CET (23:54 hrs New Zealand time). “These are different boats from what we have been used to. And the understanding of them is still a learning curve. Conditions like today? That is interesting. I am not sure they would have done too well with it. “The last thing you want to do is see one of these boats break, that is going to hurt someone or even maybe not finish. “There was a lot of seaway and so the prudent thing to do was not too go out too early. Having got to that, around 0830, I thought it was more prudent to go and have a look for ourselves. We went approximately 23.5 to 24 miles off the coast here and that would have given us a windward mark somewhere not too far off the port here. As we got 10 miles off the coast it was getting rather lumpy. We were surfing down some of the waves with the power cat. Once we turned around in the area, starting to have a look at it, there were some pretty big seas. We had the swell from the NE and the wind blowing off the west and that was throwing up some pretty big waves. "I would have not had a problem with the wind conditions. We were looking at 17-18 knots, I wouldn’t have had a problem with that. “The best conditions are those in which you don’t risk the boat. We are both (teams) agreed on that. There are big waves coming all the way down from France. The conditions were possibly boat breaking. These boats are for Formula 1 racing and you do not take them off to do the Paris-Dakar. “We did a few training races a week ago 20 miles to windward and back and it was perfect. But everyone knew before that this is not exactly the best place to do this. “We did a very nice 20 mile course up and down and also a triangle but that was one time in a month, and it was in S’ly or SE’ly wind, maybe a lot before a low is coming. We had a little right shifts but it was within the official range plus or minus 30 degrees, definitely in the range for both teams. “I have the chance to learn something every day. I love to jump from one boat to another. A year ago I was sailing around the world on my own and here I am sharing with tremendous guys with a lot of different sailing areas, from the Volvo race, from the Cup. For me it is the first time that I have felt the acceleration of a small multihull, like I love to do on the Swiss lakes, like the D35 or the small really light ones, but Alinghi 5 has the power of a big offshore multi and the acceleration of a small multihull. It is the first time I have felt both these two feelings. 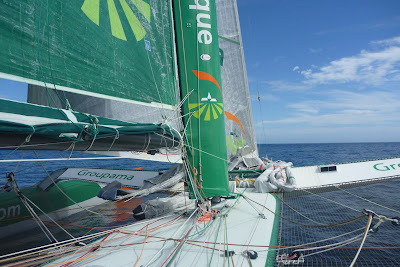 Bruno Jeanjean and Thomas Coville on board Groupama 3. Image copyright Team Groupama. Snaking between cells of high pressure, Groupama 3 is seeking to avoid being caught up in the anticyclones, which are positioned way down South... Franck Cammas and his men know that they have to endure another 24 difficult hours before they can hook onto a steadier, powerful W'ly breeze. In the atmosphere there are plateaus and craters, anticyclones and depressions... Between the two are cols and valleys. Currently approaching the Roaring Forties, from Friday morning Franck Cammas and his nine crew are likely to reach some very light, problematic conditions, however the analysis remains very positive. Indeed Groupama 3 always manages to maintain sufficient speed to get through the tricky zones before the small zones of high pressure succeed in catching up with her. "We should find wind ahead of our bows! I hope we've escaped the lightest breezes now... This Thursday morning, we weren't even making an average of six knots, with less than three knots of breeze. Fortunately we're in the process of leaving these zones, which are closing up behind us. The end of the tunnel lies at 37° South! However, in a few days time, we'll have enough wind to get the boat making good headway... And it's beginning to cool off. There are already some albatrosses in the sky, the sun is shining and the sea is the purest of blues. However, we're constantly having to trim the sails in order to escape these zones of high pressure" explained Franck Cammas to French celebrity Yann Queffélec, during the 1130 UTC videoconference at Groupama's Race HQ in Paris. To be or not to be? This is a question Franck Cammas is asking right now. This is not in metaphysical terms but rather geographical ones, as current sailing in the calms of the Forties is proving worthy of the surrealism of the Doldrums... However, the Southern summer can also be temperamental and the extension of this high pressure across the whole of the Southern Atlantic is nothing unusual. The difficulty for navigator Stan Honey and onshore router Sylvain Mondon, lies in locating a coherent route, keeping the risk of coming to a complete standstill at a minimum. "We had to make a decision two days ago: we opted for the riskier route, that's to say traversing zones of flat calm, and we're doing better than if we'd taken a big detour to get around them! We're fairly happy with our decision because we've gone faster than the wind holes, which are forming behind us..."
As such remaining on a trajectory close to that of the round the world record holder was quite logical, and on a Jules Verne Trophy, it is an established fact that leads or deficits fluctuate according to the weather data: the main thing is to maintain your trust in your boat, in your crew and in the weather forecasts, which run for another month, on as far as Ushant! Ronan Le Goff and Thomas Coville aboard Groupama 3. Image copyright Team Groupama. "We knew that our start was good and that the next stage wasn't easy: ultimately we'll have less of a deficit on rounding the Cape of Good Hope than we envisaged in Ushant! This only represents a quarter of the Jules Verne Trophy. Even though we're not in a good position for this entry into the Indian Ocean, the latter is shaping up to be favourable... The boat hasn't suffered and we should only have a deficit of between five and eight hours on the reference time." To follow, as soon as the giant trimaran has caught up with the low moving along 60° South (sic! 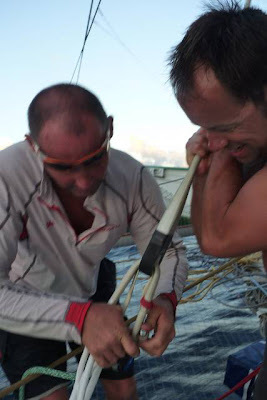 ), the tempo will dramatically increase and Franck Cammas and his men are likely to be just as fast as Bruno Peyron and his crew along this section of the course. As such the deficit amassed over the past few hours will stabilise and the passage around the Cape of Good Hope just a few hours behind the reference time won't prove too disadvantageous! 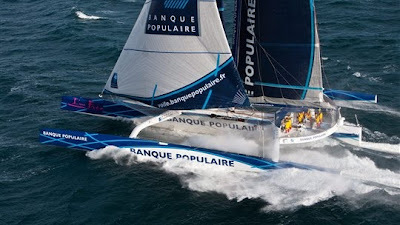 Currently held by Bruno Peyron on Orange 2 since 2005 with a time of 50 days 16 hours 20 minutes at an average of 17.89 knots. Lionel Lemonchois, Ronan Le Goff and Jacques Caraës were aboard at the time. The Longtze: takes off on another European Tour! The 2nd Longtze European Tour kicks off on the 14th February, in Monaco, with the Primo Cup – Trophée Crédit Suisse! With more nationalities represented and more boats, the Longtze European Tour looks set to enjoy the great success it experienced last year during its ‘warm-up tour’. Fifteen crews are expected at the Primo Cup, and 5 to 10 extra boats will join the Longtze European Tour in May for the Grand Prix de l’Ecole Navale. 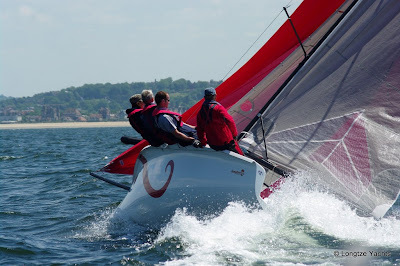 In 2009, the Longtze European Tour 2009 attracted lots of attention and sparked great interest…Skippers, sailors, race organisers, club officials : so many experts expressed their interest in this very unique sportboat. Buoyed by this success, the Longtze Premier heads off on a new tour of Europe with two new destinations and a packed fleet. As per last year, the Longtze European Tour debuts the season amidst the sparkle and prestige of the Primo Cup- Trophée Crédit Suisse. Three Swiss teams, two Russian, one Dutch, one German and eight French teams will meet on the water in Monaco this Friday. We will see sailors already accustomed to the subtleties of the Longtze Premier with the likes of the Germans led by Eckard Kaller, Nicolas Bérenger’s French team, and the Dutchman Koos van den Heuvel... but a good proportion of the crews in the line-up will discover the Longtze Premier and the circuit for the first time. Primo Cup 2009, Monaco. Image copyright Longtze Yachts. In May the Longtze Premier will discover, for the third time and with again great pleasure, the subtleties of the waters at Lanvéoc during the Grand Prix de l’Ecole Navale. 20 to 25 crews are expected to be there and this year, and for the next two years, the event has the added dimension of being the French Monotype Championship. A major meet where the Longtze Premier will be proudly represented. Another destination, another body of water, another course format: in September, the European circuit touches down in Italy on Lake Garda for the Trofeo Gorla, a 50 mile race at the foot of the Dolomites. There the crews will have to juggle with the very special effects created by this big Italian lake ! As per last year the Longtze European Tour will conclude with a Swiss event. The greatest number of teams will get together for a very festive and challenging competition. In 2009, this grand final was explosive and spectacular…watch out for it in 2010 ! With a great mix of experience, age, skills, contrasting and tactical waters, this second Longtze European Tour promises new exciting challenges. Kick-off this weekend in Monaco! 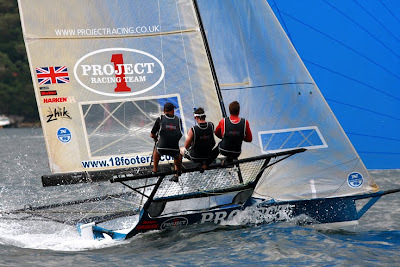 Created by Steve Thompson, a New Zealand designer, the Longtze Premier was developed by the America’s Cup Team, Le Défi. America's Cup: Race 1 - A Big Wednesday? OK Worlds: Day 3 - Game On!